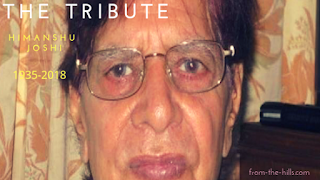 Himanshu Joshi is a well-known name as a story writer in Indian literature born on 4th May 1935 in Josiyuda village of Uttar Pradesh now in Champawat District of Uttrakhand. 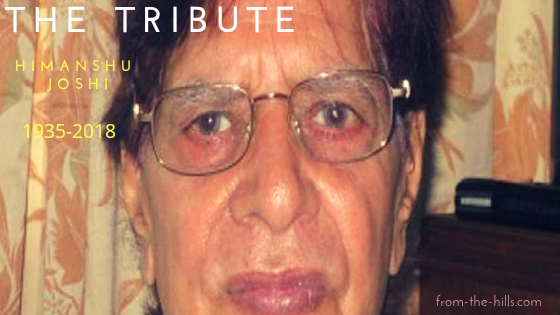 He died on Thursday, 22nd Nov'18 setting a big milestone in Indian Literature and in Uttrakhand's History. This Man from the hills has always written a lot about hills, the pain, the problems, the lifestyle of a man a woman a youth is the theme of his stories. You can relate everything he writes in his story with yourself and your lifestyle as you spend in your days in hills of Uttrakhand. He started his carrier as a reporter and turned to story writer than to novelist. He started his carrier as a reporter and turned to story writer than to novelist. These all novels are a must-read, his famous novels are. He has also written the story collection like Gandarv Gatha, Jalte Hue Daine, and Manusya Chinh. He was awarded nationally and internationally for his works. His current assignment was running with a monthly magazine provider of Norway. The Novel Tumhare Liye is one of the famous Novel written by Himanshu Joshi. DD National has made serial on it for its amazing realness and relativeness quality with the society. A youth coming to Nainital from backward hills for studies and jobs involves in a relationship there and how his life's circumstances lead his life is narrated in it. His view to Nainital and its explanation in his novel made many readers curious to visit Nainital's those places which are mentioned in the story. These things get attached to every single reader of the novel. The pass away of Himanshu Joshi is Loss to Uttrakhand's Literature Heritage it will not be easy to get such a vision and quality work to the literature of Uttrakhand.